Goodreads says, "It's been three years since the devastating accident . . . three years since Mia walked out of Adam's life forever. Now living on opposite coasts, Mia is Juilliard's rising star and Adam is LA tabloid fodder, thanks to his new rock star status and celebrity girlfriend. When Adam gets stuck in New York by himself, chance brings the couple together again, for one last night. As they explore the city that has become Mia's home, Adam and Mia revisit the past and open their hearts to the future and each other. Told from Adam's point of view in the spare, lyrical prose that defined If I Stay, Where She Went explores the devastation of grief, the promise of new hope, and the flame of rekindled romance." *If I Stay was one of the best books of 2009, in my opinion, and I cannot wait to see where Forman is going to go with this highly anticipated sequel. I loved Adam and Mia's relationship and I'm looking forward to revisiting it. 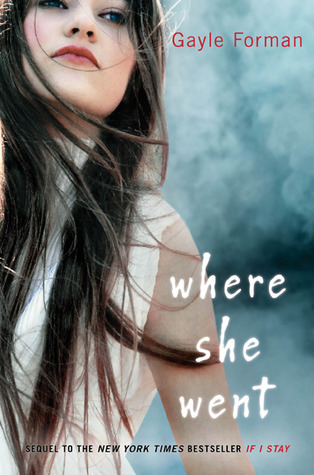 If Where She Went is as anywhere near as powerful as If I Stay, then I'm sure it will be a bestseller. I really need to read If I Stay because this sound awesome. Great pick! I still need to read If I Stay! I really love the cover of this new one! I am really excited for this one too. I loved If I Stay and hope to re-read it this spring in anticipation. I still really need to read If I Stay. I'll definitely have to get a copy soon. I still need to read If I Stay. It’s on my soon list thanks to all the fab reviews. Still need to read If I Stay...I hate to cry when I read, and I'm so afraid I'll just loose it! i haven't read if i stay but this one looks great! I still need to read If I Stay---I have it, I just need to get to it! I've heard amazing things about it, so I'm sure this one will be amazing, too! I still haven't gotten too If I Stay, But I will. Great pick! I haven't read the first one, but you've definitely intrigued me to pick it up! Awesome pick! Here's what I'm waiting for this week! I need to read this series! I've heard such fabulous things about If I Stay and I want to read so I can be in the loop:) That cover is really beautiful as well which is always a bonus. I haven't read If I Stay but I have heard so MANY people rave about it. great post--I need to get on the ball and check out this author! Looks beautiful. I still need to read the book, it all sounds so sad and intense.